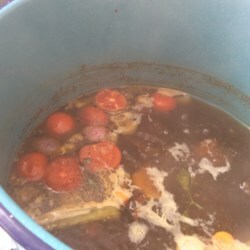 Very good tasting beef stock. It is very time consuming and lots of work, but definitly worth it in the end. I will be using this stock to make onion soup. Since it is a complicated recipe I doubled it so that I can freeze some for later use. I used 6 lbs of beef ribs and doubled the rest of the ingredients. The ribs have more meat than soup bones so it still had a wonderfully rich flavor. The only small change I did was use beef bouillon instead of salt.